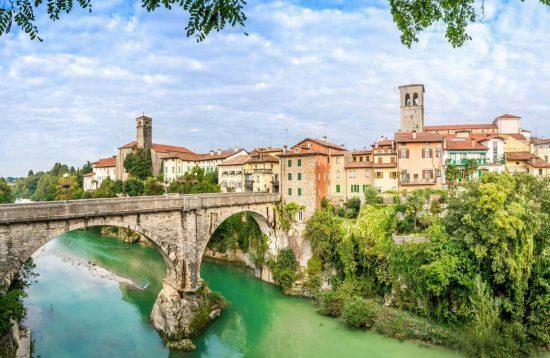 9-day cycling journey from the high peaks and green valleys of the Julian Alps to the limestone caves of Karst region and further on along a disused railway line of the Parenzana at the Italian, Slovenian and Croatian Coast. All about the Slovenia and Parenzana Cycling. A carefully designed cycling journey, taking in all of Slovenia's highlights - from the high peaks of the Julian Alps to the incredible limestone caves and traditional countryside, cycling on an old disused railway line now intended for cyclists, The Parenzana, from Trieste in Italy to Poreč in Croatia. 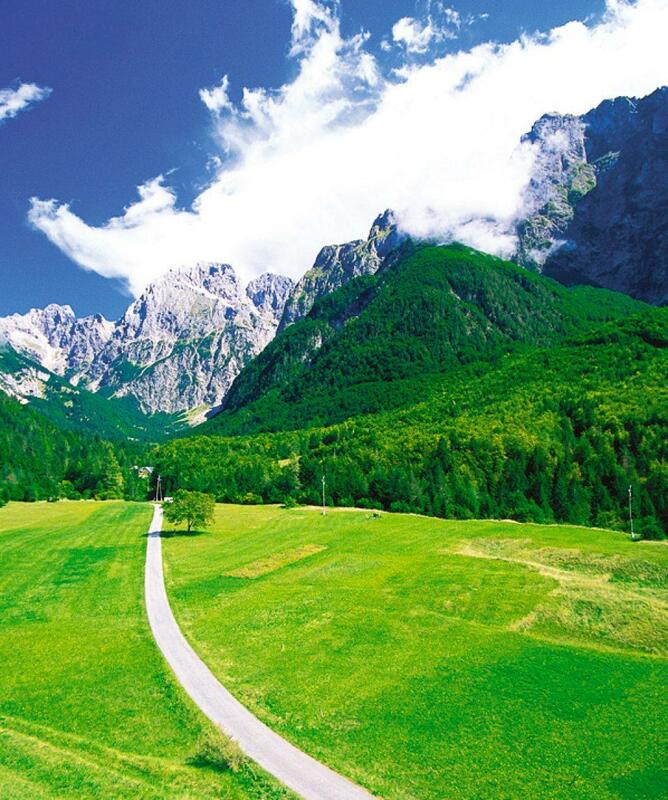 Breathtaking scenery of the Julian Alps with Triglav National Park. Drive across Vršič (1611 m), the highest mountain pass in Slovenia. White water rafting on Soča river - "The Emerald River"
Cycling through Trenta Valley - along the emerald Soča river. Visit Škocjan Caves (UNESCO) with a deep underground canyon. Sightseeing of Trieste (Italy), Portorož and lovely Piran. Cycling on former Parenzana railroad trail. Experience the charming scenery of the Istrian peninsula (Croatia). Note: You will switch from the hybrid Trek bike to a mtb Trek Marlin 7 (29') in order to have an enjoyable cycle on the Croatian part of the Parenzana trail (switch on day 7 in Portorož). Full organisation of the tour. Introductory briefing on day 1. Booklet with detailed itinerary, route instructions, transfer timetables and vouchers. 8 nights in 3*accommodations, bed & breakfast. Dinner with wine tasting at a tourist farm in Medana. 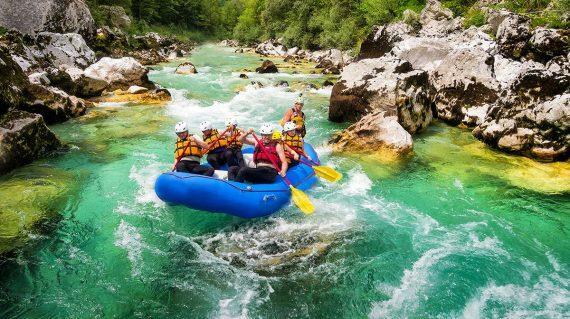 Activities: White water rafting on Soča river, Bovec. 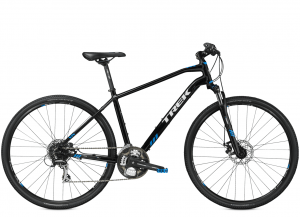 8-day rental of Trek Hybrid bike with 2 side panniers, helmet, lock, pump, spare tube, repair kit, basic rain jacket, ... (you will change the hybrid bikes for mtb Trek Marlin 7 (29') for cycling on the Parenzana trail). Entrance ticket to the Škocjan Caves (UNESCO). Transfer from Ljubljana to Bled (day 1). Transfer from Kranjska Gora to Trenta Valley via Vršič Mt Pass, 2116m (day 2). Transfer from Medana to Štanjel (day 5). Transfer from Poreč to Ljubljana (day 8). Main luggage transfer from Bled to Poreč. Food and drinks: lunch and dinner on all days and all beverages. Luggage transfer between towns - you carry all your gear in panniers from days 2-7. Upon you arrival to Ljubljana Airport, a private transfer to Bled will be waiting for you. 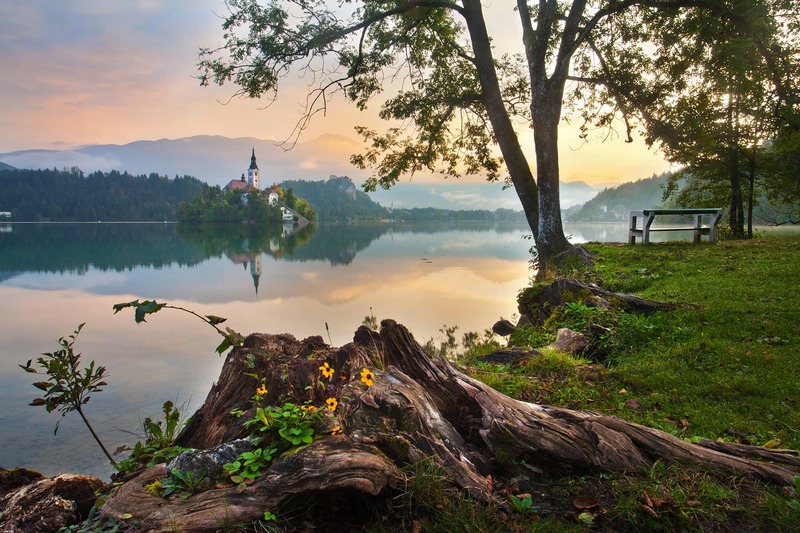 After check-in at your accommodation and a short briefing with our staff, where you will receive bikes and booklet with maps and instructions, you will have the rest of the day to explore Bled on your own. 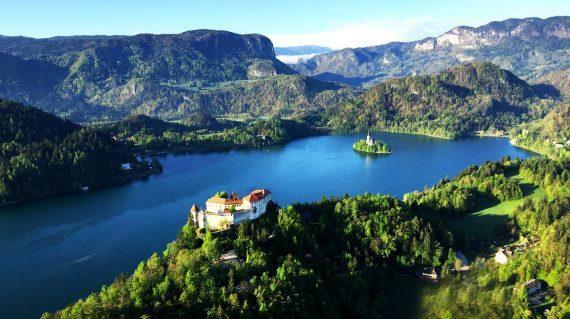 You can cycle around Bled Lake to check the bikes, take a boat to the island, visit the breathtaking Vintgar Gorge or over 1000-year-old Bled Castle. 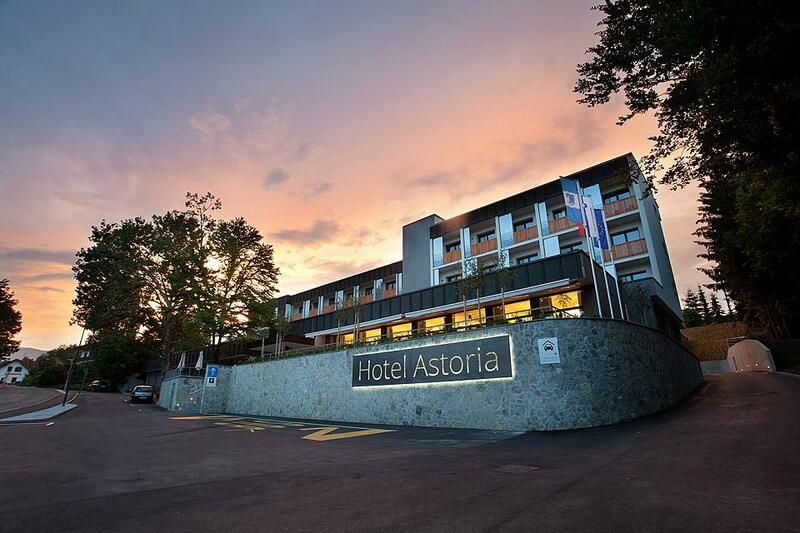 Accommodation: Hotel*** in Bled, bed&breakfast. 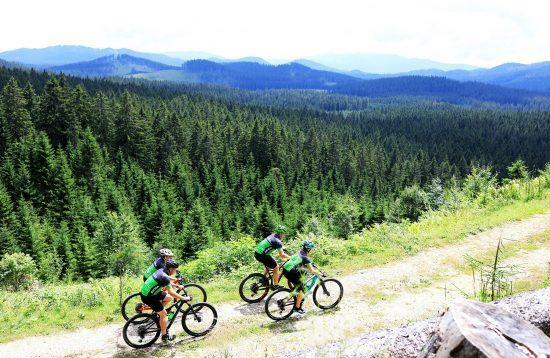 First day of cycling will take you through breathtaking Radovna valley towards Kranjska Gora - a small Alpine town, located at the foot of the mighty Julian Alps. From Kranjska Gora a private transfer will take you to Trenta valley, across Vršič mountain pass, which is the highest mountain pass in Slovenia (1611m). 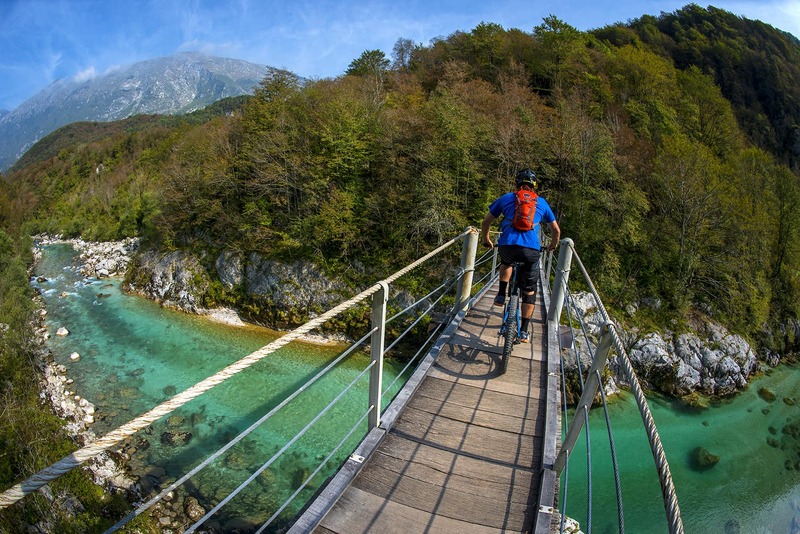 You will continue cycling through Trenta valley, along the emerald Soča river to the town of Bovec - the adrenaline capital of Slovenia. 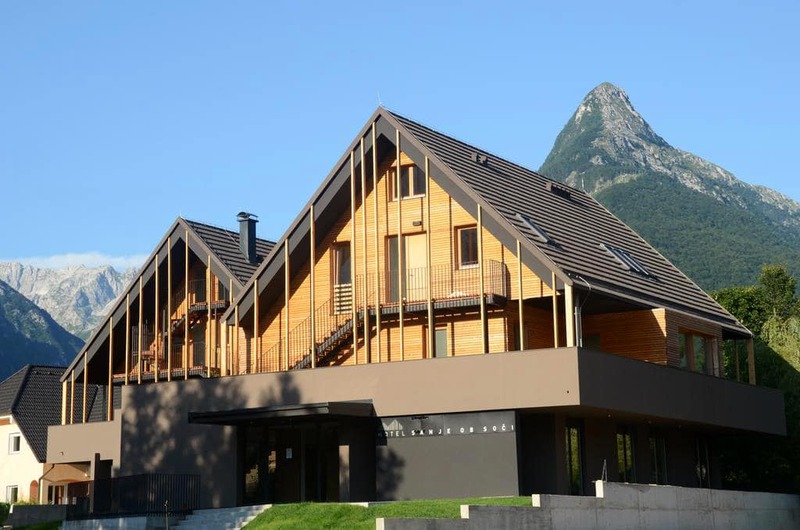 Accommodation: Hotel*** in Bovec, bed&breakfast. In the morning you will go white water rafting on Soča river. The rapids on the river are level III-IV. At the end point of rafting, your bikes will be waiting for you to start today's cycling tour. 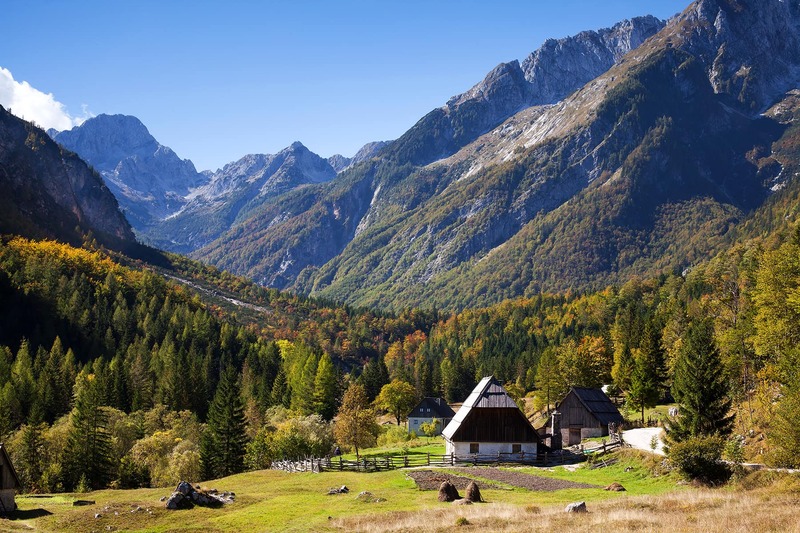 The route will take you through small villages located by the Soča river. In the town of Kobarid you will have a chance to stop and visit the well-known WW2 museum, or do a short hike to Kozjak - one of the most magical waterfalls in Slovenia. From Kobarid you will cycle towards Tolmin. In the afternoon you will be able to visit a nature's wonder - The Great Tolmin Gorge. 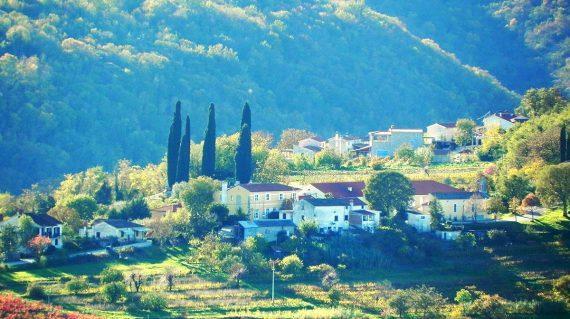 Accommodation: Hotel*** in Tolmin, bed&breakfast. Route continues following the river. 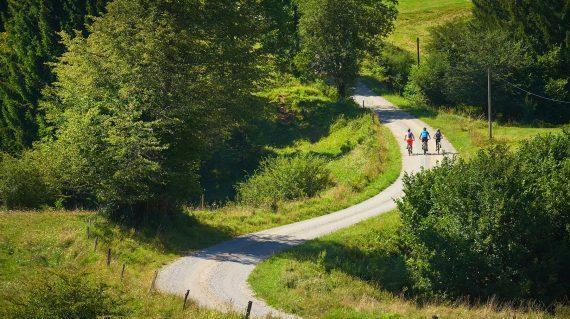 You will cycle past well-known Most na Soči and Kanal, from where you will ascend towards well-known Goriška Brda - a region famous for producing some of Slovenia's finest wines. Overnight at a tourist farm in Medana with dinner and wine tasting. Accommodation: Tourist farm in Medana, bed&breakfast. In the morning a private transfer will take you to a small town of Štanjel, from where you will cycle to Škocjan Caves. You will visit these breathtaking caves, before cycling further on towards Trieste in Italy. Accommodation: Hotel*** in Trieste, bed&breakfast. 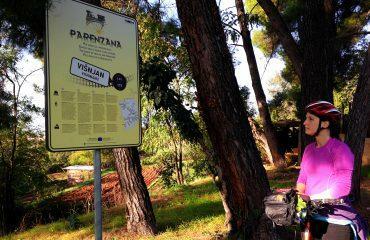 Today is the first day of cycling on the Parenzana Trail. 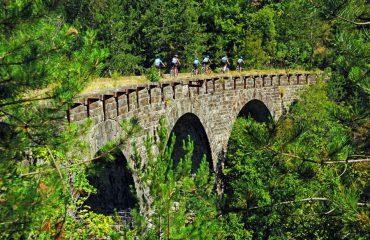 From first station of this former railroad, you will cycle out of Trieste, cross the border with Slovenia and continue along the coast towards the town of Portorož. 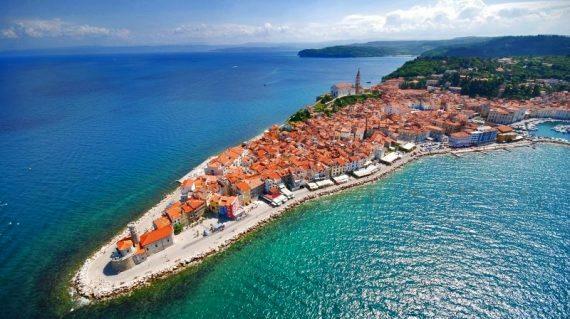 In the afternoon, an optional visit of a small, medieval town of Piran, located on a tiny peninsula. Accommodation: Hotel*** in Portorož, bed&breakfast. Just outside of Portorož, you can stop for a visit of Sečovlje Nature Park - the biggest and the oldest salt pans in Slovenia, where salt is still produced in a traditional way, based on a 700-year-old method. 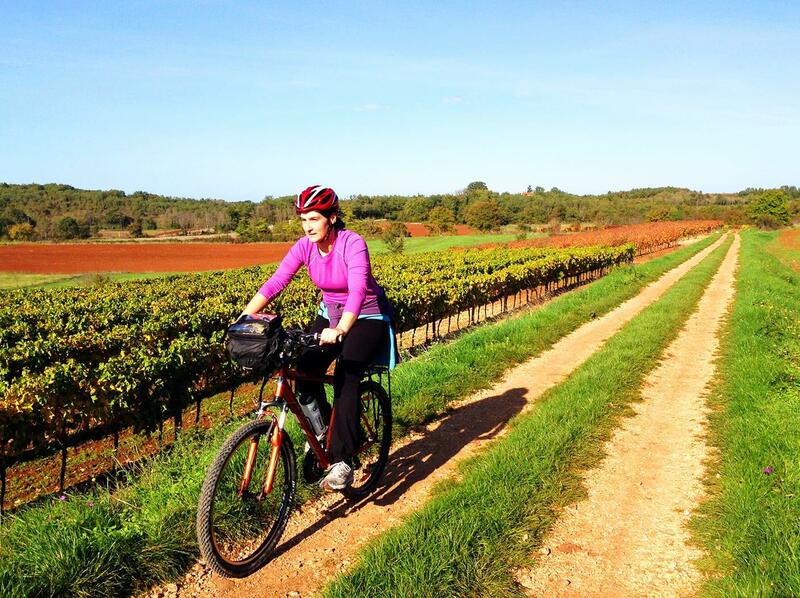 After crossing the Croatian border you will cycle on the most scenic part of the Parenzana. 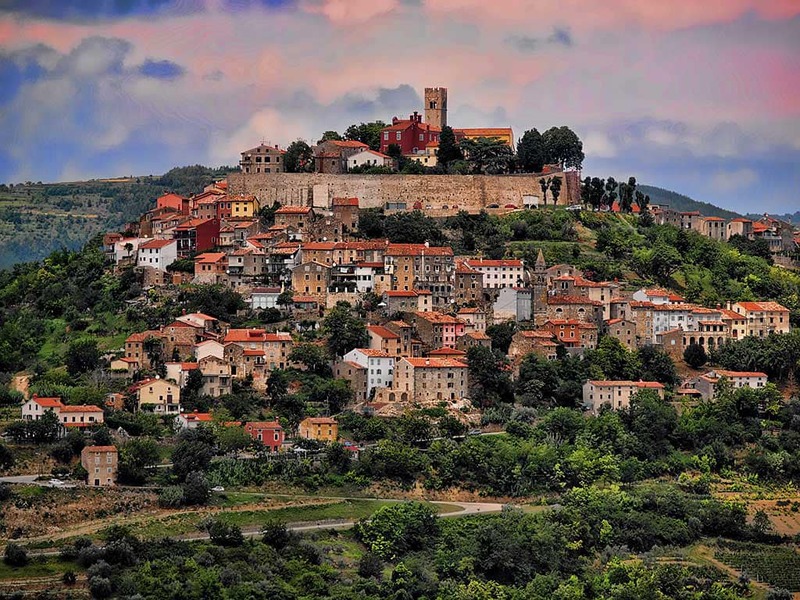 The path will take you through medieval hilltop towns of Buje, Grožnjan and Motovun. 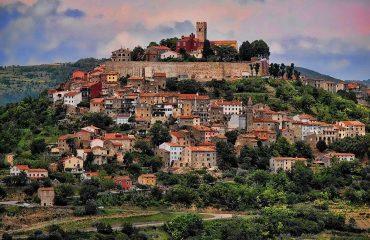 Accommodation: Hotel*** in Motovun, bed&breakfast. 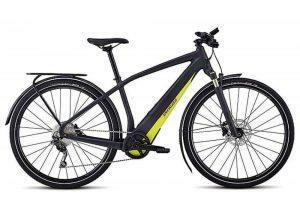 Note: You will change the hybrid Trek bikes for mtb Trek Marlin 7 (29') for cycle Parenzana trail. 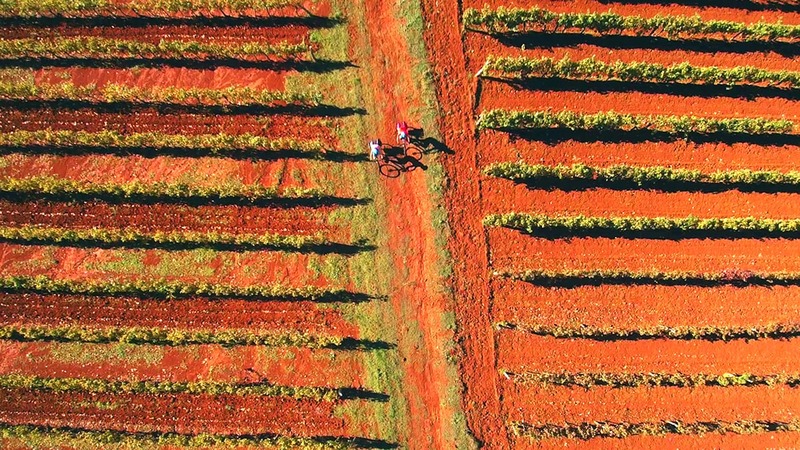 On your last day of cycling, you will cycle on the last part of Parenzana - from Motovun downhill towards the beautiful coastal town of Poreč. Enjoy a relaxing afternoon at the Coast, take a walk on the beach and watch a breathtaking sunset. Accommodation: Hotel*** in Poreč, bed&breakfast. After breakfast your trip concludes. A private transfer will pick you up and take you to Ljubljana Airport. 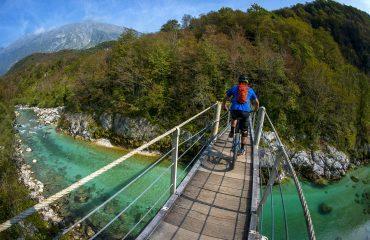 Cycling trekking in Slovenia. Self guided tour. Day 1: 3* Hotel in Bled, Slovenia (double/twin room with breakfast). Day 2: 3* Hotel in Bovec, Slovenia (double/twin room with breakfast). Day 3: 3* Hotel in Tolmin, Slovenia (double/twin room with breakfast). Day 4: Tourist farm in Medana, Slovenia (double/twin room with breakfast and dinner with wine tasting). Day 5: 3* Hotel in Trieste, Italy (double/twin room with breakfast). Day 6: 3* Hotel in Portorož, Slovenia (double/twin room with breakfast). 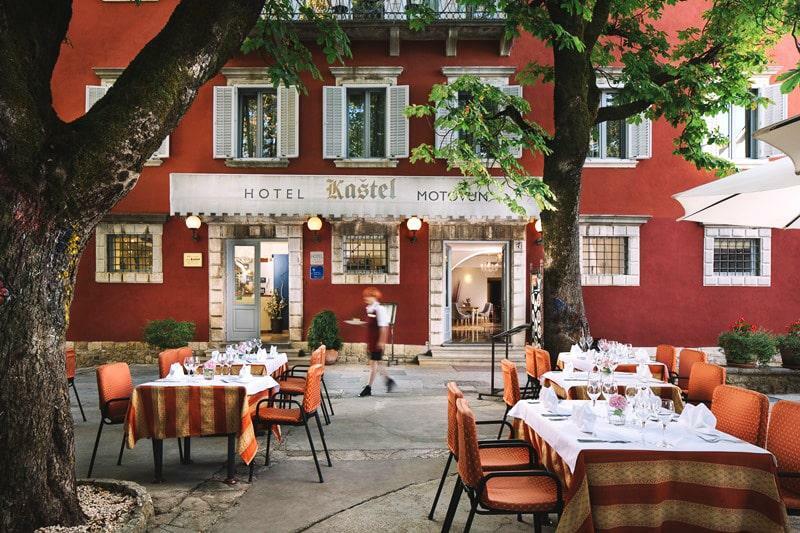 Day 7: 3* Hotel in Motovun, Croatia (double/twin room with breakfast). Day 8: 3* Hotel in Poreč, Croatia (double/twin room with breakfast). What kind of equipment and personal belongings do I need?How demanding is the tour?Tips and suggestions?Do I need an insurance?What kit is provided?What do I do with my main luggage?What kind of accommodation can I expect?Why book this tour with us?What kind of bike will I use? What do I do with my main luggage? What kind of bike will I use? The tour is considered to be moderate to challenging. 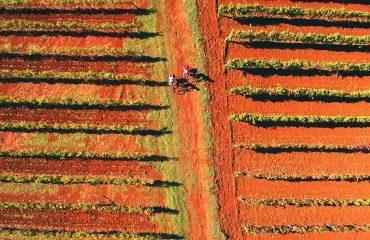 There is an average of 40 kilometres of biking each day with many ascends and descends. A good physical condition is essential. The tour is not appropriate for children younger than 15 years and for pregnant women. We include the hire of your quality bike in the overall cost of the tour: you don’t need to bring your own or pay extra to hire one locally. We provide full bike set: a pump, lock, Topeak tool, spare inner tube and tire levers. Helmet, brand new quality water bottle (0.5l) and side panniers are also included in the price of the tour. You will be travelling with panniers attached to your bikes, so be ready to pack accordingly. You can keep your remaining luggage with our representative, who will deliver it to you on last day. Upon request a day-by-day luggage transfer can be organised. Send us an email for more details. Each day you will be staying in a different accommodation. 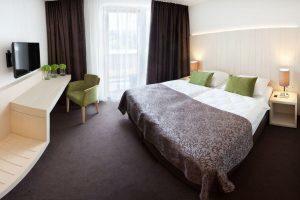 You will be staying in smaller 3* hotels in double/twin rooms. 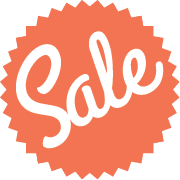 We are specialists for self guided tours and holidays throughout Croatia and Slovenia, with creative itineraries that feature the best of each region at the greatest possible value to you. 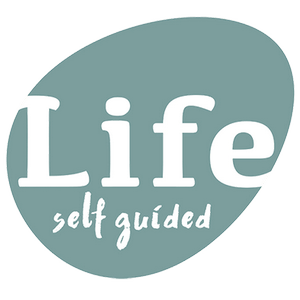 With over 15 years of experience, we know all the secrets of self guided tours. We are a team, which passionately believes that adventure and sustainable travel makes the world a better place. We are committed to creating unique stories, successful tours, itineraries and holidays. At LIFE Adventures we have carefully chosen itineraries to showcase the best of the region. Our itineraries are designed with flexibility and comfort in mind. In many places we stay for two nights, giving you the option to cycle, walk or take a break and relax instead. 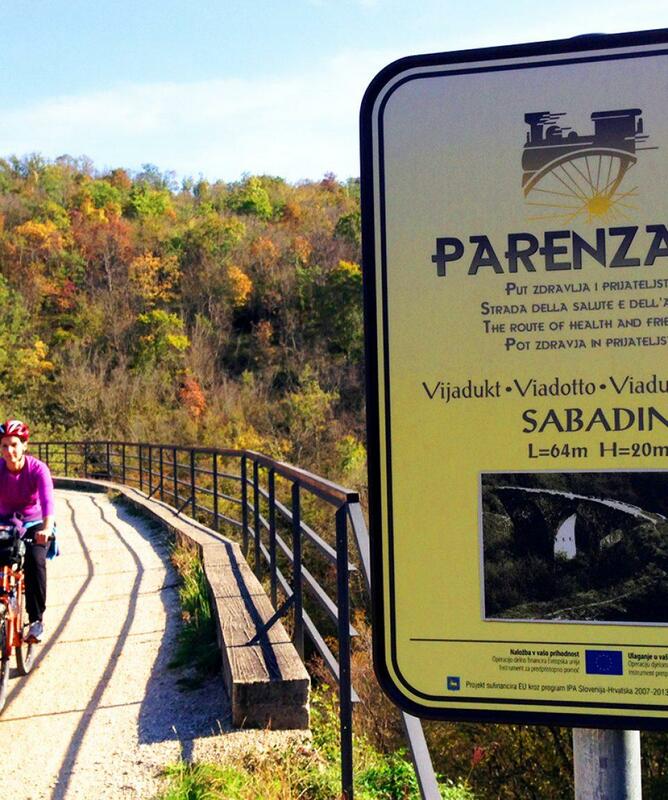 My wife and I want on Life Adventures 8 day self guided Slovenia and Parenzana cycling adventure. Honestly one of the best weeks of our lives. Great pre trip communication. Excellent briefing at beginning of trip - big folder with detailed directions, maps and all we needed. Great bikes. Fabulous variety of scenery. Perfect level of challenge for the cycling. With van transfers for the alp pass. Great extras - rafting, cave visit and winery lunch. Good quality hotels. Great value - I calculated it would cost not much less to organize it all privately. Couldn't recommend too highly. One trip, three countries, eight days on two wheels. Crossing the picturesque Julian Alps in Slovenia. 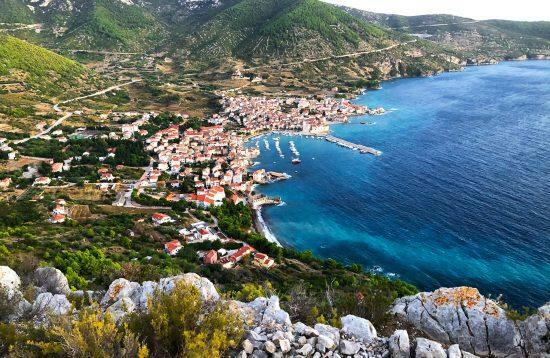 A pizzaslice of Italy, the 42km coastline of Slovenia and then further on the old Parenzana railwayline in Croatia. On day one you soon become aware, whilst cycling, of Slovenia's pristine friendlyness. Spectacular stone castles look down on Lake Bled and many tourists. We enjoy it on our new horses around the lake. Day two takes us up the Radonva valley in the Triglav National Park. We are so proud to have packed all our essentials in four panniers. Now I know how to pack for the rest of my life. Goodbye to suitcases bulging with clothes never to be worn. Hot but pleasant once the bike-aircon kicks in. Then the wonderful D2 cyclepath. Effectively utilising old railwaybridges and infrastructure up to Kransjska Gora. By taxi we cross the Julian Alps through the spectacular 50 hairpin bends. 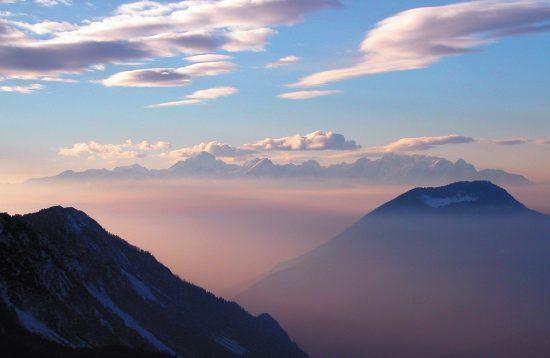 The Vršic Pass is Slovenia's highest at 1611m. The Alps tower up to 2864m. Then down in the emerald Soča Valley. Day three starts with the best breakfast in Slovenia at the Hotel Sonje ob Soci in Bovec. The owner's wife is more than a chef, perhaps a humble food magician. She takes pride in her tasty delicacies. My favourite was the Zuchini carpacio, fresh from her garden. The whitewater rafting was calm. The personel enthuastic. Tolmin via Kobarid was hot at 40 degrees. Marko has a good bikeshop in Tolmin. He made the necessary adjustments to Benita's derailer that gave her more gears for those uphills. The Hotel Krn ( or Dvorec) has had a facelift with the new owner. The old criticism in Tripadvisor is unfair. It was, however, our only hotel without aircon. The chef was friendly and recommended an excellant Sauvignon Blanc of the area. Day four included the longest and toughest climb for me. Benita had less problems. Fortunately uphills are rewarded with views and downhills. All the sweat disappeared with the sumptuous meal with superb wines at Medana. Thanks, Tina, for this special treat. Our taxidriver to Nova Gorica was punctual and knowledgable. We discussed Slovenia's unusual 10day war for independence in 1991. All our drivers were proud ambassadors. Day five started with the taxi up to Stanjel. Absorbing the beauty downhill was shear pleasure. We often stopped at bars for water or coffee. English was never a problem. A cooldown shower fell when we were in the Skočjan Caves. The pickup at Lipica worked well. Majestic Lipizzaners. We laughed when we crammed the bikes and 2 tall bodies into the taxi. With Benita on my lap we arrived at Hotel Roma in Trieste. I washed our cycling clothes every evening. It dried sufficiently overnight. Day six started with the ferrycrossing to Muggia. I would strongly recommend this change to your itineary. The ferry pickup is near the hotel. It takes 30 minutes to cross. It is cheap and you avoid all the Trieste traffic. At Muggia cycle back for 10 minutes towards Trieste. The Parenzana route is after the first small bridge. Out of Italy and back into Slovenia with its short scenic 42 km coastline. The clean well-lit 550m old railway tunnel says much of a country ensuring safe rides for cyclists. Portoroz is like a beehive of tourists. All enjoying their vacations. Day seven we cross the Croatian border. All our hotels on the entire trip were superb. We drank the local water in our bathrooms. We slept very comfortably. Yes, there were days when the cumalative affect was felt in my 67 year old legs but the rewards made it disappear. Regarding the required fitnesslevel for the trip. In Cape Town we try to cycle regularly. We are not fanatics. It was good to experience en route how popular tourismcycling is. 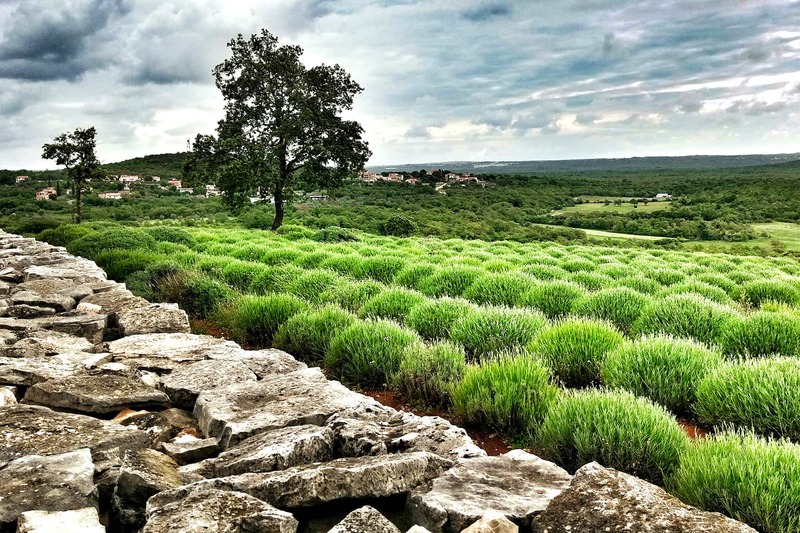 Croatia's section of the Parenzana is more stoney. We had 3 punctures and were ably assisted by our host from B and B Antico in Motovun. Please convey my appreciation to him again. Day eight to Porec we decided to remain on tar. To sum up. The trip has incredible potential and many of my friends will partake. I would rate the tour 4.5 out of 5. I would suggest a hybridbike with a fatter tyre and a fan in the hotelroom in Tolmin. Thanks to Life Adventures (Tina Verk) and all the roleplayers. H.R.